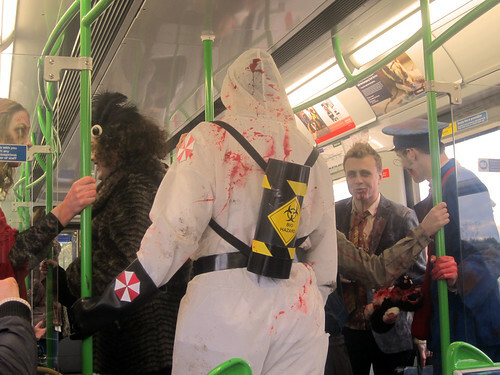 Tonight's the night on the London Underground to look out for people with colour drained from their faces, walking zombies and those who've lost the will to live (and no, I'm not referring to the people stuck on the Central Line this morning). It's Halloween. I spotted these very well kitted out Halloween party goers on Saturday afternoon, clearly getting into the spirit of things quite early. I liked how the guy on the right looked slightly like an old school ticket inspector, checking to see if the undead had still paid the right fares. Look out for ghosts, ghouls and other Shaun of the Dead extras on your journey tonight and also for people studiously trying to ignore them. Following on from the various "guerilla" London Underground stickers that have been spotted across the network, here's a less than subtle transformation. 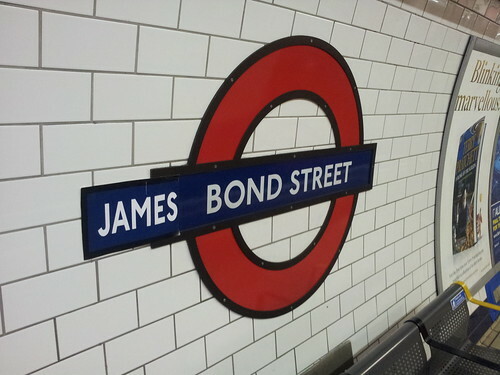 Someone seems to have taken to heart, the fact that some of the new James Bond film is set on the Tube. 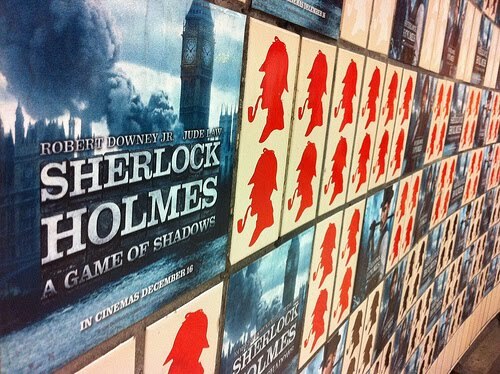 Baker Street Tube was temporarily re-tiled last December for the 2nd Holmes film & previously a Robert Downey Jnr wax work model had its home at the station too. Should TfL allow rebranded Tube Stations? 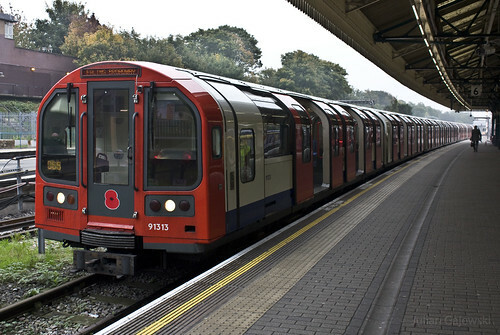 Spoof London Underground Stickers "Craze"
Look out for Poppy wrapped London Underground Circle Line trains this year as proposals have been put forward to acknowledge Remembrance Day across the transport network. In addition to the Circle line train wrapping, an Overground train and up to two buses will be covered with poppy livery. Normally I've only seen people selling poppies at Tube stations but this year there will also be "announcements to recognise the invaluable contribution of service men and women in London have made to the protection of Greater London and its inhabitants, communicating this to Londoners and others using the transport network who may not ordinarily be aware of the sacrifices made." It looks as though 50 Tube stations will carry announcements by Barbara Windsor and ads will be displayed at Westminister Tube promoting TfL’s war veterans’ fares concession. 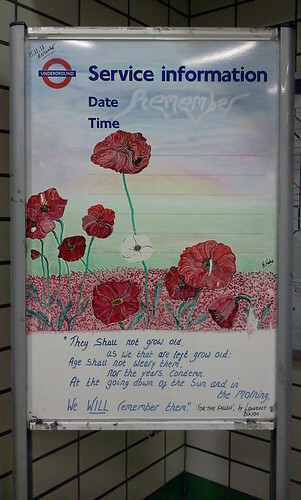 There are also plans for poppies to be displayed on the front and side of every Tube, DLR and London Overground train. 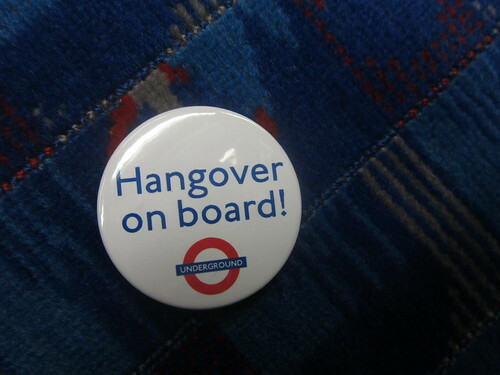 TfL will bear the cost (approximately £210,000) for the activities & advertising which will run up until 30th November 2012. 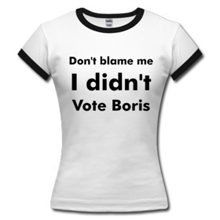 Full details are on Greater London Authority's website. < I thought the justification in the GLA's memo for doing this was interesting, "With the passage of time and with the prominence of other matters, be it the state of the global economy, house prices or the alledged activities of the press, it is easy for Londoners to forget the invaluable contribution service men and women have made to and for the protection of London, Londoners and to the way of life to which we have become accustomed". Although I wonder why this is the first year (correct me if I'm wrong) that this has happened? 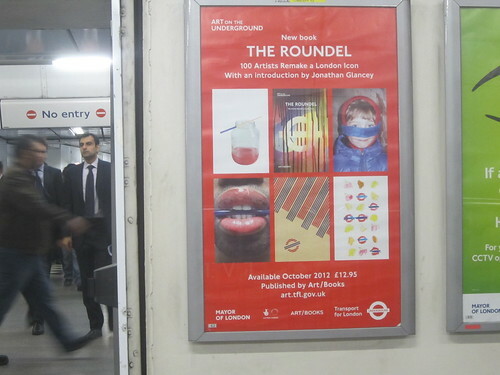 Welcome if you arrived to my blog from the BBC's article on the Guerilla Sticker Craze on the Tube and thanks to Andy Dangerfield for interviewing me about it. As I said in the article, these stickers have actually been around on the London for many years in some shape or form, but recently they have become much more inventive. My favourites are the non graphical ones as they actually do blend into the commute more. 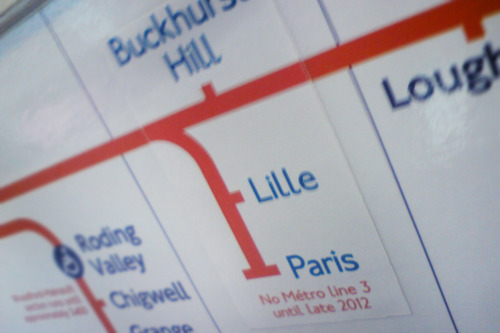 I love the explanation for Lille: "It is a little known fact that between Woodford and Buckhurst Hill there is a lightly used tunnel which provides London Underground commuters direct access to the Paris Metro. Providing you’re not in a hurry, you can just sit back (if you can find a seat), relax and simply show your passport when the border guards pass through the train." As Andy points out in his article there are some websites around that are selling the stickers, and now that the "craze" has been published in The Sun today & on Mashable in the US, one can only imagine there will be even more interest and even more inventiveness in the creations. If you spot any more on your journeys, let me know. 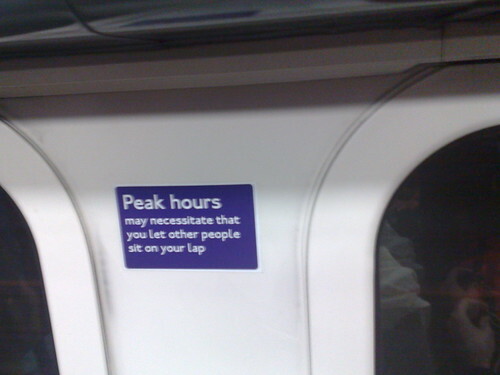 Here's something to pass away the time on a London Underground journey. 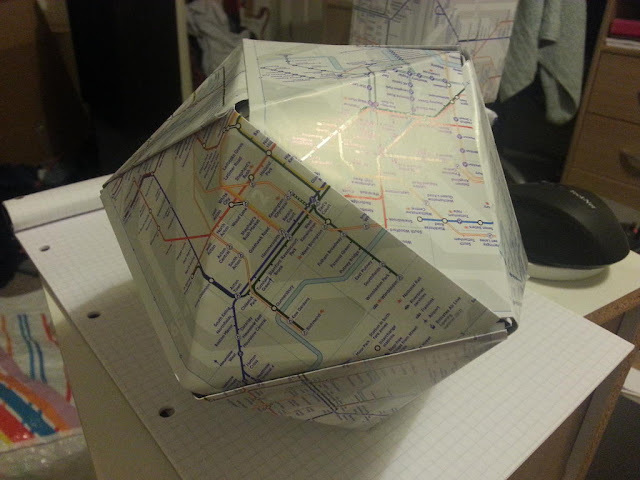 Matt Scroggs has taken up the task of folding Tube maps into interesting geometric shapes with some nice results. 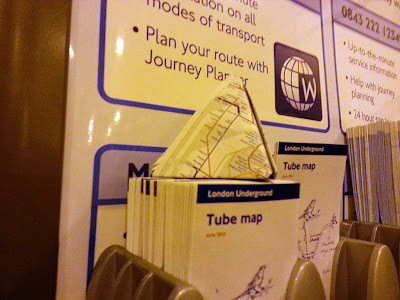 He said "after re-reading chapter two of Alex's Adventures in Numberland (where Alex learns to fold business cards into tetrahedrons, cubes and octohedrons) on the tube, I folded two tube maps into a tetrahedron"
Sometimes in pubs I used to spend time folding empty crisp packets into shapes (don't judge me! 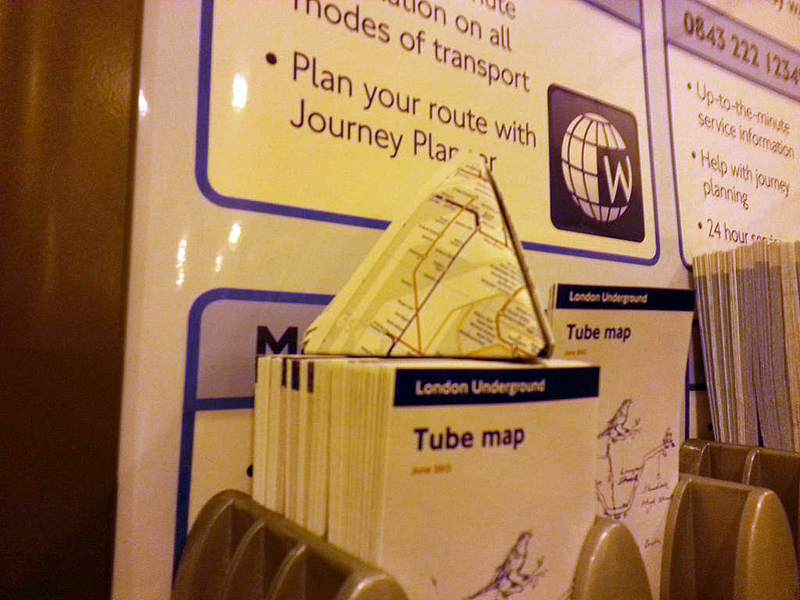 ), so I can see how Tube map folding could become rather addictive. Perhaps it will take on & we'll see people folding maps with the same intensity as being invovled in a Sudoku puzzle. Oxford Circus Central Line Interchange Changes? "Why I am putting fingers to my keyboard, is I was hoping you might be able to shed some light about what's going on at Oxford Circus Tube Station. On arriving at the station last night I was greeted by a blocked off accessway (that usually takes you to a little escalator which whisks you down on to the Central Line platforms) covered with a plethora of construction and planning notices. An LUL member of staff was standing next to the blocked off accessway so I asked him what was going on? 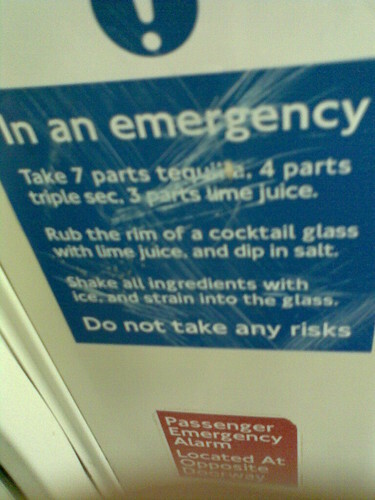 He replied, dont worry, the Central Line was still working. Ok so why has the usual accessway been blocked off?, I chirruped back. He replied that it was nothing for me to worry about. Oh, well is it works being carried out?, I chirruped further. 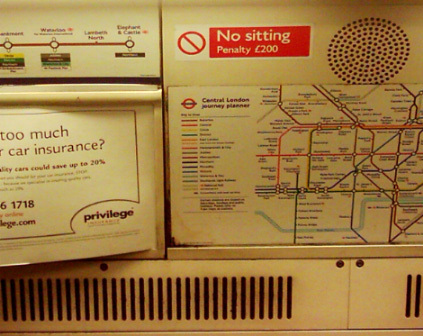 Escalator, he chimed back, follow the notices on the way for alternative route to the Central Line. And do you want to know how long it takes to use their `alternative' route (esp. in the middle of rush hour)? Another 5-10 minutes on your journey (depending on how fast you walk) as it takes you to another bank of escalators, on to the southbound Bakerloo Line platform, which you then have to walk down, exit, walk on further, round and round, and then walk up and down steps, until you finally manage to come full circle to reach the Central Line platforms. Aside from the odd disgruntled comment on Twitter I havent been able to find any reference to these works on-line (not even on LU's website) and wondered if you might have any information on how long this accessway/escalator will be closed down for?" If anyone knows what this is about or how long it's going on for please let us know. Update - Just heard from TfL's Press Office who said "Due to planned escalator maintenance work, the single escalator that leads down to the Central line platforms will be out of service to passengers. 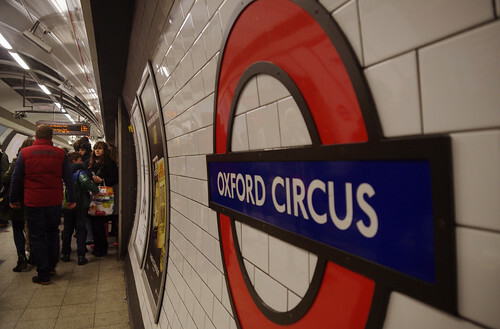 Customers wanting to use the Central line from Oxford Circus will be directed to alternate routes around the station by staff and signage that is up at the station. The works which commenced this week are due to be completed by early November. 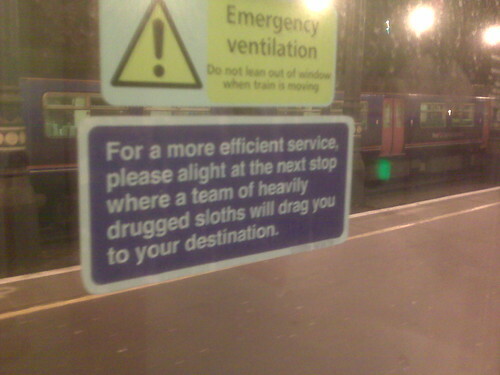 We apologise to customers for any disruption this may cause to their journeys." So now we know. 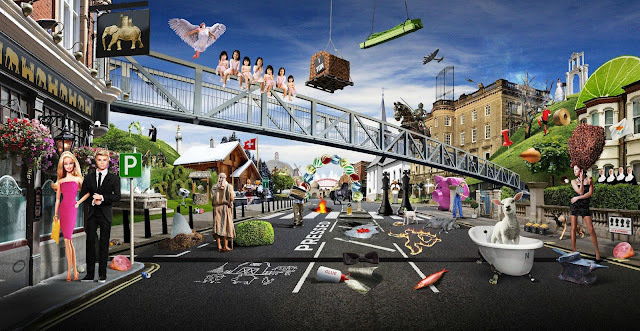 How many London Underground stations can you find in the picture below? 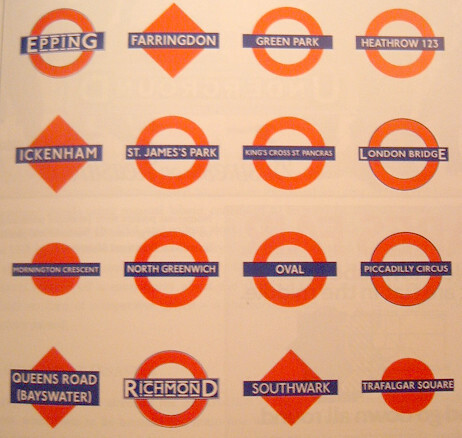 Someone has made an excellent montage of a street scene filled with puns of Tube station names. Apparently there are 70 in total! The full image is in the link here, and should keep you busy for a while! Many thanks to @NewburyNewbie (who originally found this on News of the Unreal) for sending this my way. The answers may (at some stage) be revealed at the #lookforlonger site & a number of people have seen this as a poster at Tube stations too.